HABIT: Brightly colored leaves on tall stems from tubers. White varieties seem to be more sun tolerant. CULTURE: Plant tubers in well-prepared beds after the soil temperatures have warmed in the later spring. Both the air and soil temperatures need to have warmed to prevent the bulbs from rotting in the ground. Plants die at frost and it is usually not recommended trying to save the tubers through the winter. Keep the flowers cut off. Mix compost, lava sand, expanded shale and earthworm castings into beds before planting. 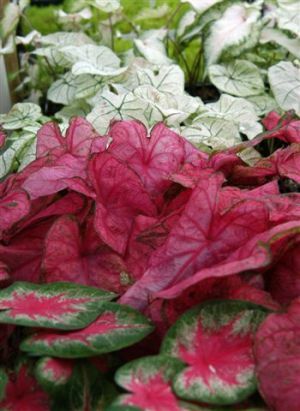 USES: Color in groundcover areas, containers. PROBLEMS: Wind damage. Over-fertilization will cause leaves to lose color. NOTES: Most commcial tubers are produced in Florida. The whites are my favorites, such as ‘Candidum’, ‘Aaron,’ ‘White Wing’ and ‘Jackie Suthers’. Mother plants are native to the riverbanks of the Amazon. 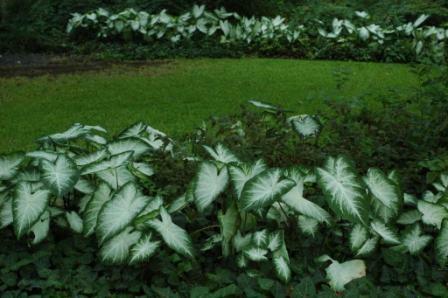 The Caladium Aaron, 'Caladium', has impressive white with green edged foliage. 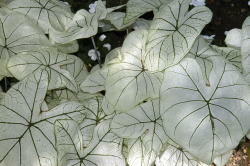 Being one of the largest Caladiums, ‘Aaron’ has white centers and the veins gradually creep into the deep green edges. It has a plant height of 18-20” and a spread of 12-18”.